The fall is my favorite time of the year. I love the fall, getting up with crisp, cool air, no allergies!! And the best part - getting to sleep with the windows open, nice breezes, and waking up and just taking in huge deep breaths of cool air. And it's not too hot, not too cold, and wear jeans, a t shirt and a sweatshirt or sweater. What I love most though, is the nights that I can watch some movies after a nice walk outside. I love watching movies in the fall and winter. 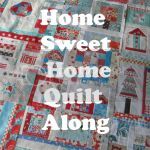 There's just something amazing about curling up on the couch with one of my quilts, having a cup of hot tea, coffee or hot chocolate and watching a nice movie. Depends on the day what kinds of movie I feel like watching.